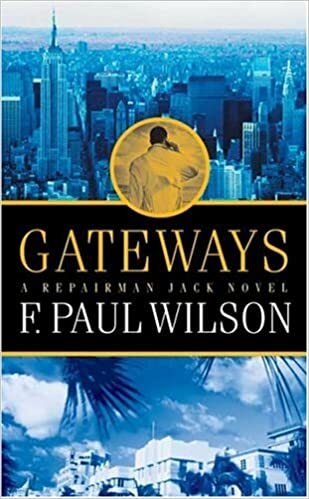 Following last year's successful The Haunted Air, F. Paul Wilson returns with another riveting episode in the saga of Repairman Jack, the secretive, ingenious, and heroic champion of those whose problems no one else can solve. As Dean Koontz says, "Repairman Jack is one of the most original and intriguing characters to arise out of contemporary fiction in ages. His adventures are hugely entertaining." In Gateways, Jack learns that his father is in a coma after a car accident in Florida. They've been on the outs, but this is his dad, so he heads south. In the hospital he meets Anya, one of his father's neighbors. She's a weird old duck who seems to know an awful lot about his father, and even a lot about Jack. Jack's arrival does not go unnoticed. A young woman named Semelee, who has strange talents and lives in an isolated area of the Everglades with a group of misshapen men, feels his presence. She senses that he's "special," like her. Anya takes Jack back to Dad's senior community, Gateways South, which borders on the Everglades. Florida is going through an unusual drought. There's a ban on watering; everything is brown and wilting, but Anya's lawn is a deep green. Who is Anya? Who is Semelee, and what is her connection to the recent strange deaths of Gateways residents-killed by birds, spiders, and snakes-during the past year? And what are the "lights" Jack keeps hearing about-? Lights that emanate twice a year from a sinkhole deep in the Everglades . . . lights from another place, another reality. If he is to protect his father from becoming the next fatality at Gateways, there are questions Jack must answer, secrets he must uncover. Secrets . . . Jack has plenty of his own, and along the way he learns that even his father has secrets.